MR. NEANDERTHAL MAN – Good afternoon! Wuh! Where you spring from? Time machine. I’m from the future. Not heard of place called fyoo-cher. But you look very strange – you obviously foreigner. How you speak my language? Courtesy of a universal translator, old chap. Umm – It look like nothing I seen before! What you want, anyway? Well, I’m doing a survey and I’d very much like your opinion. Huh! Me very busy man – got much hunting to do for food and skins for mate an little ones back at cave. While me away, other menfolk in tribe look after them, so must provide for them, too. You take up my time – it cost you. Let say haunch of Auroch, six brace of game birds, bushel of trout, sack of fruits, roots an nuts, two mammoth tusks, two woolly rhino horns, three bearskins and half-a-dozen flint scrapers for start – depending on how long it take and what it entail. Wuh! Migrating mammoth, that simply amazing – how you do that? Replicator – a very handy gadget to have around the home. My name is Darkendale, by the way. Damian Darkendale. What is yours? Um! Dug. Bin Dug of the Clan Dug. What you want to know, Darka-day? 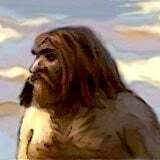 I want to know what you – as a Neanderthal man; think of Modern man. How the hell do I know – I never heard of him? Who this Modern man? Let me show you a holodisc of my world and it’ll put you in the picture. It includes a history of humans from before your day to mine – in a very comprehensive forty-five minute showing. You see, it’s become of great interest to the people of my time to find out just how, primitive people such as yourself would have seen us from their viewpoint. Here I’ll just switch it on – there we go. I’m sure you will be dazzled by the leaps and strides that mankind has made over the millennia. Great Hunter in big sky – this world is very strange. Well, now you’ve watched it all – what do you think, Mister Dug? Huh! So that what you call Modern man. Me not impressed. Him ride on backs of giants, like ticks on hide of mammoth. Him become soft and spoiled – living on accumulated knowledge handed down to him on plate by many generations of hardworking ancestors. Most things he handle, already made for him by technicians and craftsmen. Yet, craftsmen with special skills not really appreciated by those who use them – and skills passed down less and less in each generation through lack of interest and implementation of inferior cheap methods of mass production. Technicians and operators got machines made by engineers and inventors who also either another dying breed or tiny minority of clever-dicks usually ignored by those who do not even want, let alone try, to understand them. Modern man got lot of gadgets to do all the work for him and transport him about. He can use them with ease because they so constructed. Mostly though, he got no clue how they put together or conceived, he also often ignorant of scientific principle behind them. He sit and scoff himself into obesity on unhealthy processed food, lounging in front of television set, which he not know how to assemble, let alone manufacture. If he got dumped on Desert Island, he would revert to standard of living more primitive than ours. In fact, him lose hell of a lot over the ages – rather than gain. Mass production of intensely cultivated food and domesticated livestock encourage vermin and disease and allow glut of people with physical and mental disabilities to flourish, where in natural circumstances they would perish. This system also produce social order with unnaturally large population of poorly integrated super-tribes with clashing cultures. This is formula for great disaster. Modern man greedy, selfish and vain – he destructive, impulsive and warlike – he impoverish environment and drive animals and plants and other peoples to extinction. If they go, he go! Even when told this, he either not believe or not care. This not progress – but degeneration on large scale. Though we both have common ancestor, I’m glad Modern man is separate species and not directly descended from my people – bad enough him being cousin species. Eh? Wha? Splutter! You – you’re joking, of course, Mister Dug! Maybe you joking, Mister Dar-ka-day – Me deadly serious! But I can’t believe – I mean – choke – thank you for your opinion, Mister Dug.